This is a 2nd story house with full gutters along with a heavily clogged downspout. Customer is complaining he's got a big time overflow! This is how Angel leaves your gutters every time! You can count on Angel year after year. First-class, Superior service, Time-tested! SO YOU THINK YOUR GUTTERS ARE OK? Clogged gutters cause mold, fungus, dry & wet rot, roof leaks and water damage. HOW DOES ANGEL CLEAN YOUR GUTTERS? Angel is cleaning gutters on up to 2-story houses using his hands, ladders, leaf blowers, a few more tools, and some techniques. He will start with blowing off all the debris on your roof (if any). Then he will clean your gutters by hand taking his time. After that he will blow off all your gutters along with blowing air through your downspouts. In case a downspout is severe clogged, he will use a "snake" or, if this doesn't work, he will take apart your downspout. He will blow air through your underground drains. However, if there is an underground drain clog this will require a separate service charge (upon your approval). Finally, he will clean around your property and any mess that he may have done during the gutter cleaning process. I, Angel Todorov, as an owner and operator of ANGELINDY always guarantee my work. If you have any complaints or you are simply not completely satisfied with my job after I have serviced your house, please contact me within 30 days and I will come right out for free. 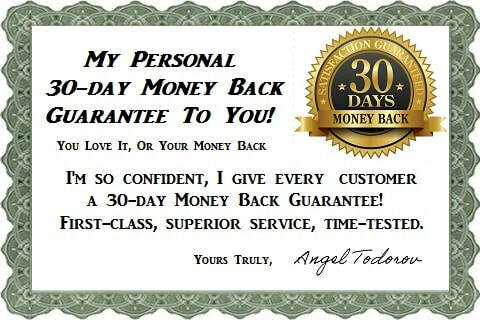 In case I cannot do anything to reach your level of satisfaction, I will gladly refund your payment in full for the provided labor. No questions asked!